Treflite™ Cove Mortar is a 100% solids, three-component epoxy mortar with selective aggregates to make cover base installation simple and easy. No expensive or complicated tools are necessary to form a professional looking permanent cove base. Treflite™ Cove Mortar resists chemical attack and provides long-term wall to floor joint seals. Forms an impervious seal against dirt and bacteria. 30 linear ft. at 4" high x 2" base at 1/4"
1/2 gal Part A (resin), 1 qt Part B (hardener), 25 lbs Part C (aggregate) - volumes and weight approximate. Treflite™ Cove Mortar is approved for shipping to all 50 states by ground or air. Do you have to use all of the sand provided in the pail of Treflite? We wan't a looser mix for our repairs, will it still set up? You can withhold as much as much aggregate as you would like in all of our epoxy mortars if you require or prefer a losser mix. The part C sand has no effect on set time. Part A resin and Part B hardener could be mixed without any sand. How long do I have to wait for Treflite to cure before we can drive over it with heavy loads containing 10,000 lbs.? You can open up the area to heavy traffic within 18- 24 hours at 70 degrees. How thin can we apply Treflite to resurface a whole area? We have some major patch work to do at several inches thick, but we also would like to resurface the rest of the floor with minor rough areas to level. 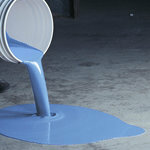 Treflite can be applied at a minimum thickness of 1/8” thick. You can certainly use It to build up as thick as you need to for the larger voids first, then resurface the whole floor at an 1/8” thick for a uniform finish. Treflite can also be top coated with any of our epoxy/novalac/urethane coatings if you require a smoother and more impervious surface or just overall improved aesthetics. Can I use Treflite to patch various areas that have high chemical spillage? Yes, you can use Treflite, then we suggest top coating the Treflite with Nutracid (novalac epoxy) to add a more impervious and chemical resistance surface.